OMAHA, Neb. (CNS) — About 800 people witnessed history June 18 as the Archdiocese of Omaha advanced to Rome the sainthood cause for Father Edward Flanagan, Boys Town founder. 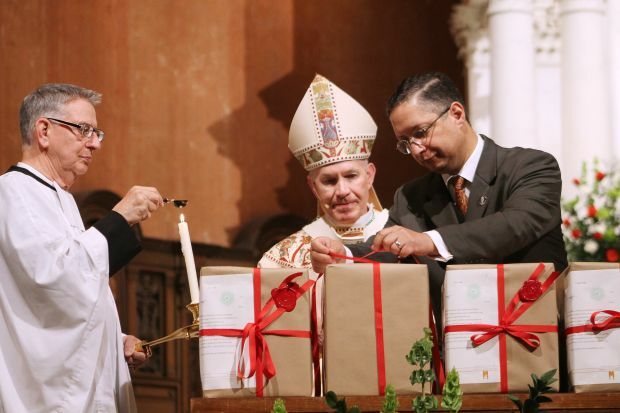 Archbishop George J. Lucas was the main celebrant of a morning Mass at St. Cecilia Cathedral in Omaha that marked the closing of the archdiocesan phase of the canonization effort with a special ceremony to encase and officially seal four boxes — 4,600 pages — of documents detailing the archdiocese’s three-year investigation. In general, two approved miracles attributed to the intercession of the candidate are needed for sainthood — one for beatification and the second for canonization. The ceremony was a once-in-a-lifetime event, a first for the archdiocese, to have one of its members — an archdiocesan priest — advance toward possible beatification and canonization, said Omar Gutierrez, notary for the archdiocesan tribunal for the cause. Among those concelebrating the Mass were Bishop Kevin Doran of Elphin, Ireland, Father Flanagan’s native diocese, and Father Patrick O’Toole, pastor of the parish in which Father Flanagan grew up in Ballymoe, Ireland. Numerous people have worked on the sainthood cause “diligently and respectfully over several years,” Archbishop Lucas said in his homily. Like Pope Francis, Father Flanagan has “put a face on the precepts of the Gospel,” a witness that extended from Omaha out into the world, for believers and nonbelievers, the archbishop said. Father Flanagan cared for the physical and spiritual well-being of children, Archbishop Lucas said. And that ministry continues today at Boys Town, evolving to meet the changing needs of youths, he said. Boys Town residents filled two pews toward the front of the cathedral. Archbishop Lucas had them stand for special recognition after Communion. 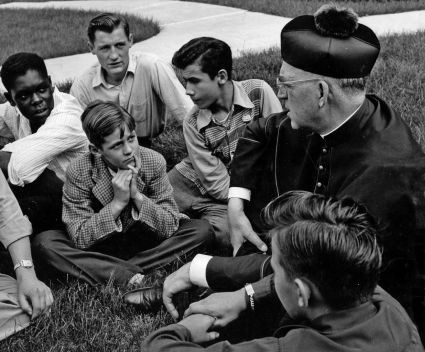 “I’m afraid Father Flanagan would have put the brakes on this whole thing if I hadn’t recognized” the students, he said. Members of Father Flanagan’s family also attended, including three great-nephews: brothers Mike, Jim and Ed Flanagan, all of whom live in Omaha. Ed Flanagan, who serves on a board of directors for the Father Flanagan League Society of Devotion, said he felt “honored and blessed” by the large turnout.